I hope the winners of the ‘Who Am I’ quiz have received the Wanoja Priangan coffee delivery, and if they have, their testimonies are most welcomed. It reminds me of the time when Sumarhum – a man of whom the farmers of Bondowoso respect – together with his sons Yusri and Heri (both also coffee farmers), paid me a visit at the small stall in front of the hotel I was staying, all the way from Bondowoso to Jember, where I was attending a Coffee Conference. 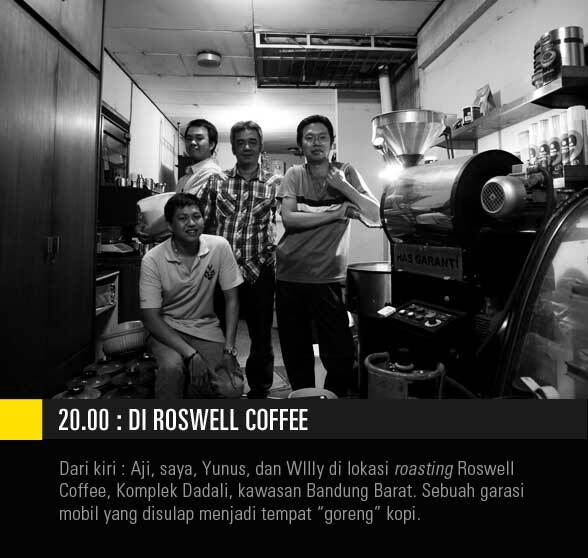 Image 2: 20:00 – At Roswell Coffee : From left: Aji, I, Yunus and Willy at Roswell Coffee’s roasting site; Dadali complex, West Bandung. Once a car garage, now a coffee roasting site. My meeting with those fine gentlemen shows that coffee plantation in Bondowoso region is hoped to potentially grow, along with the involvement of ICCRI (Indonesian Coffee and Cocoa Research Institute). Although Java Raung and Si Petung are some of the many popular Bondowoso coffee variants, it doesn’t do any harm for them to receive more public attention. 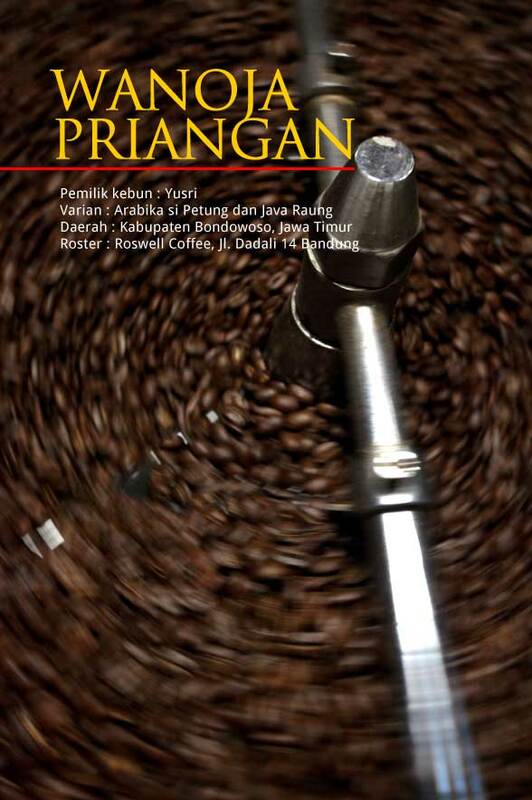 This time, through a mixture of Java Raung and Si Petung that Wanoja Priangan was born, a blend that was created due to the insufficient amount of coffee that was supposed to be roasted, were separated in 5 kg roasting drums. So I decided to put them both in and out came Wanoja Priangan, a blend that was created not because I was an expert in coffee blending, but because of the insufficient amount of coffee to be roasted. After tasting it, I decided that it was worthy to be introduced to you all, my beloved readers. The twenty lucky winners will be able to taste this superior East Javanese coffee, although in relatively smaller scales, which I will increase in light of the upcoming event. The story begins in Bandung, my lovely hometown. Image 3: Bandoengsche: Best Fun on Earth : Welcome to my pride and joy, Bandung. Despite the fact that it’s becoming more crowded and challenging to enjoy, it remains charming as always, especially with its Art Deco style buildings – a second famous Art Deco site after the city of Miami in the United States. The hometown of Cikopi.com is Bandoengsche. I usually avoid going to Bandung, especially when it’s one of those in-between public holidays and the city is swarmed by people in their private cars coming from Jakarta. She is no longer as comfortable and shady as she used to, when the street of Ir. Haji Djuanda was still quiet, compared to the now bustling Riau street, with all kinds of trading activities. But she is Bandung, where my home and heart is and will always be, with her food, fashion and arts that she brings into this world. For some reason, I am always fascinated with the artistic, colonial Art Deco-style buildings that are scattered all over the city. There are so many of them that Bandung places second in having the most Art Deco architectural buildings, after the city of Miami in the United States. Because I’ve been there before, I can say that the ones in Bandung has more local touches that are very down-to-earth, because they harmonize European architecture with Indonesian tropical condition. On your next visit to Bandung, try to enjoy the luxury of Villa Isola, or Santo Petrus (St. Peter) Cathedral, both are some of the works of CP Wolf Schoemaker, who was Soekarno’s architectural teacher when he was studying at Bandung Institute of Technology. Anyway, talking about the beauty of Bandung is a never-ending discussion, so let’s move on to the reason why I visited Bandung this time – what else if not coffee? Bondowoso Coffee Beans. One of the best coffees in Indonesia is located in Bondowoso regency, which is supported by the ICCRI (Indonesian Coffee and Cocoa Research Institute) in Jember, East Java. One of them belongs to Yusri, who created Si Petung and Java Raung, which are famous amongst many coffee enthusiasts in Indonesia. Yunus (from Roswell Coffee) and I agreed to roast the coffee last Friday evening, in his own garage at his home in Bandung. Two Arabica coffee variants, Si Petung and Java Raung were already provided in precise amounts for the 20 quiz winners. For your information, Yusri the coffee plantation owner is quite busy handling coffee orders that there was a limited amount to be given away. You may wonder though; If it’s from East Java, then why is it called “Wanoja Priangan”, which sounds very Sundanese? When this project was discussed, I asked Yusri to name it with the inspiration from a traditionally-known Javanese icon. Instead, he gave the entire decision to me, and he asked that it was to be given a catchy name that had marketing gimmick aspects, and of course, sounded very chic. So Wanoja Priangan was chosen, without eliminating the origin of the coffee itself, which is mentioned on its packaging, complete with contact information for those who are interested to directly get in touch with owner of the plantation himself. Real specialty coffee from Toni Wahid which is rich in spices and tastes kind of chocolaty. When drunk, it leaves a fruity taste that will blow your mind! Mirza Luqman, a Q Grader, had evaluated this coffee and she also gave me a note on its flavour, which I then translated into what is being written on the front of the packaging. 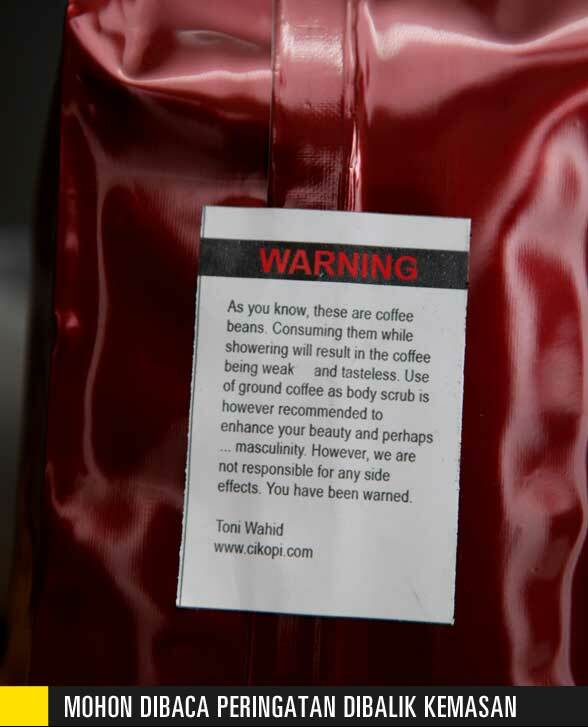 I hope you can understand my rather unsual ways with words, including the warning label on the back, which is far from the usual coffee warning labels that you come across from. 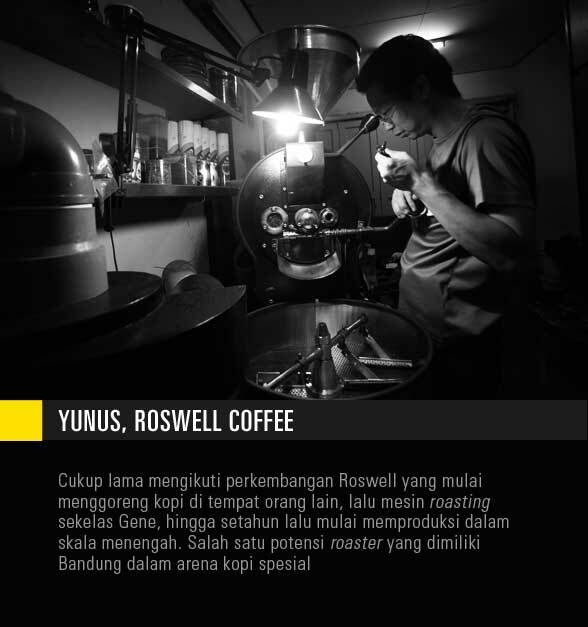 Yunus, Roswell Coffee. 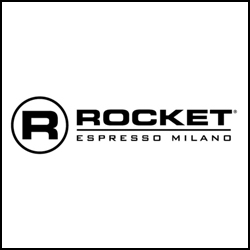 I’ve been following Roswell Coffee’s path for quite a while now; who started roasting coffee at a place which belonged to someone else, and then equipped a roasting machine in the same calibre with the Gene, until about a year ago when they started producing in larger scales. Roswell Coffee is definitely one of the potential specialty coffee roasters in Bandung. 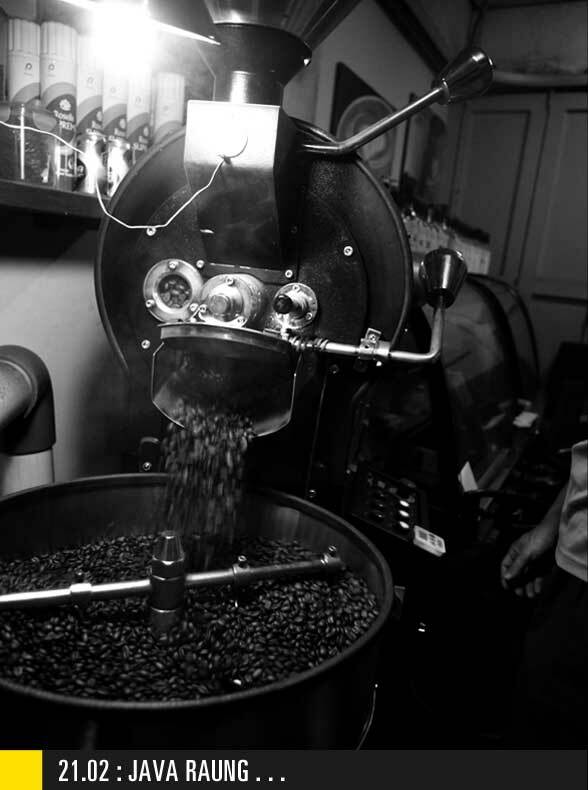 The roasting and labeling process ended at eleven o’clock midnight, and immediately I had to drive back home, all the way from Bandung to east Pondok Gede, arriving at two o’clock in the morning. Then I spent all Sunday to Monday preparing and packing and sending them off to the winners via JNE. When you receive it and try it, don’t hesitate to comment, give advise or simply tell me what you think of the Wanoja Priangan. But as a side note, I hold all liabilities, so if it tastes rather unsual, please don’t blame the farmers or the roasters, because I am fully responsible in terms of aroma and taste. The Wanoja Priangan project and another blending project which is on its way is just a minor contribution from people like Yusri and the farmers association at Bondowoso region, and I do hope that you remember them all when you’re enjoying this special coffee. Of course it will enhance the experience when you’re drinking it while listening to a Pantura dangdut remix (ed. Dangdut is a genre of Indonesian popular music that is partly derived from Malay, Arabic, and Hindustani music). Trust me on this one. Have a great and awesome cup! Saya harapkan sebagian pemenang quiz tebak siapa saya sudah menerima kiriman kopi Wanoja Priangan dan mohon berbagi testimonial di sini. Jadi teringat saat Sumarhum orang yang dituakan oleh kelompok tani di Bondowoso beserta anaknya Yusri serta Heri, petani kopi, sengaja jauh-jauh dari Bondowoso menemui saya di sebuah warung kecil di depan hotel tempat saya menginap di kota Jember saat acara Temu Lapang Kopi . Ready to send. 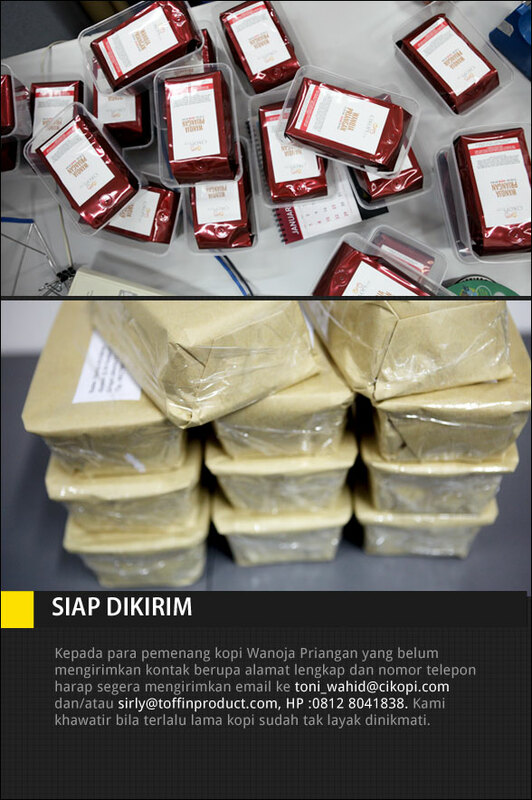 To the Wanoja Priangan coffee winners who haven’t sent their contact information (address and phone numbers), please send an email to toni_wahid@cikopi.com and/or sirly@toffinproduct.com, mobile: 0812 8041838. 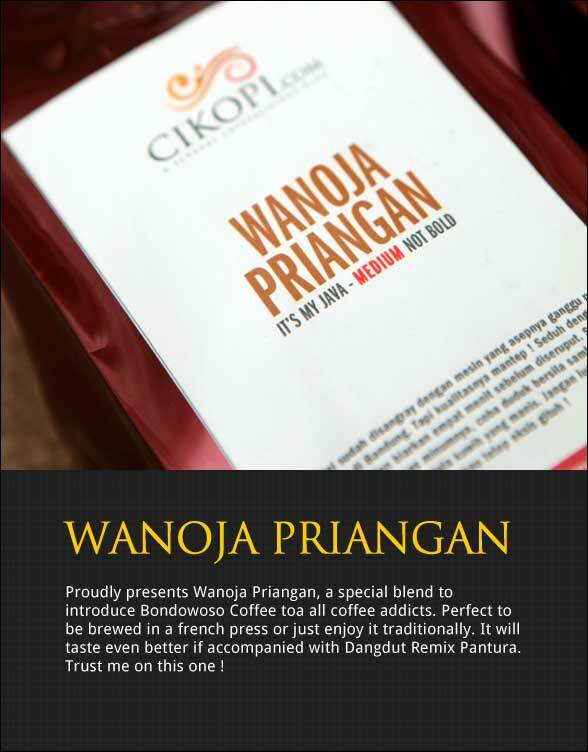 Our concern is so that you will be able to enjoy Wanoja Priangan it is prime period before it starts losing its taste. Pertemuan dengan mereka menyiratkan betapa besar potensi perkebunan kopi di Kabupaten Bondowoso diharapkan semakin meningkat dengan keterlibatan pihak Puslit Koka. Walau Java Raung dan Si Petung sebagai salah satu kopi Bondowoso sudah cukup populer, tapi tentu tidak ada salahnya bila kopi Bondowoso lebih diperkenalkan lagi kepada publik. Kali ini melalui sebuah campuran antara Java Raung dan Si Petung yang melahirkan Wanoja Priangan, sebuah racikan yang lahir karena jumlah kopi yang tidak mencukupi untuk digoreng terpisah dalam drum roasting yang berukuran 5 kilogram. Maka jadilah saya putuskan untuk memasukan keduanya dan lahirlah Wanoja Priangan, sebuah campuran yang tercipta bukan karena saya bisa nge-blend, tapi kepepet karena jumlah tak mencukupi. Setelah dicoba ternyata hasilnya layak dikenalkan kepada Anda. 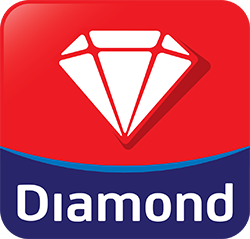 Dua puluh pemenang akan dikenalkan dengan kopi unggulan dari Jawa Timur walau dalam skala yang sangat kecil akan saya tambah jumlahnya dalam event mendatang. Perjalanannya dimulai di kota Bandung, kampung halaman saya. Biasanya saya selalu menghindari Bandung terutama saat libur kejepit saat kota ini dipenuhi oleh kendaraan terutama dari Jakarta. Ia tak lagi senyaman dan serindang dulu manakala jalan Ir. Haji Djuanda masih belum terlalu ramai, pun jalan Riau yang sekarang sudah begitu hiruk pikuk dengan serbuan kegiatan ekonomi. Tapi inilah Bandung, rumah dan cinta saya, makanan, mode, dan berbagai karya seni banyak lahir di kota ini. Tapi entah kenapa sedari dulu saya selalu terpesona oleh artistiknya bangunan-bangunan kolonial yang bergaya Art Deco yang bertebaran di berbagai lokasi kota ini. Saking banyaknya, hingga Bandung menempati urutan kedua dalam hal bangunan kuno gaya arsitektur setelah kota Miami di Amerika. Karena pernah ke Miami, saya bisa berkata bahwa bagunan di Bandung lebih punya sentuhan lokal yang sangat membumi karena kemampuannya mengharmonisasikan bangunan gaya Eropa dengan kondisi tropis Indonesia. Sesekali bila Anda berkunjung ke Bandung, cobalah nikmati kemegahan Villa Isola atau gereja Katedral Santo Petrus, sebagian karya monumental CP Wolf Schoemaker, guru arsitek Presiden Soekarno saat kuliah di ITB. Ah sudahlah, saya bisa tak henti menceritakan Bandung dan mari kita beralih ke topik “kopi”, tujuan saya datang ke Bandung kali ini. Saya dan Yunus dari Roswell sepakat untuk melakukan proses roasting pada hari Jumat malam kemarin bertempat di garasi rumahnya di kota Bandung. Dua varian kopi arabika Si Petung dan Java Raung sudah tersedia dengan jumlah sangat pas untuk ke-20 pemenang quiz. Maklum, Yusri sang pemilik kebun kopi terus ketiban order cukup banyak dan membuat stok menjadi sangat terbatas. Kalau kopinya dari Jawa Timur mengapa namanya menjadi “Wanoja Priangan” yang sangat Sunda ? Pada saat projek ini digodok, saya meminta Yusri untuk menamai kopinya dengan ikon kejawaan yang sangat kental. Namun ia malah menyerahkan sepenuhnya kepada saya untuk memberikan nama yang mudah diingat serta punya aspek marketing gimmick, dan tentu saja chic. Jadilah nama Wanoja Priangan dipilih tanpa pernah menghilangkan jejak darimana kopi ini berasal yang disebut pada kemasannya berikut kontak bagi Anda yang berminat menghubungi pemilik kebun. Mirza Luqman, seorang Q Grader telah menilai kopi ini dan memberikan catatan rasa yang kemudian saya “terjemahkan” dalam bahasa seperti yang tertera pada kemasan di bagian depan. Semoga Anda bisa memaklumi kegilaan” saya berbahasa termasuk label peringatan dibagian belakang kemasan, yang juga “sesuatu banget”. Proses roasting hingga pelabelan berakhir menjelang pukul 11 malam, dan saat itu juga saya harus kembali lagi menempuh perjalanan dari Bandung ke kawasan Pondok Gede Timur hingga jam 2 dini hari. Lalu hari Minggu dan Senin tadi bersiap untuk masalah pengepakan dan pengiriman dengan JNE. Saat Anda menerima dan mulai mencobanya, jangan ragu untuk memberikan komentar dan saran atau kesan Anda setelah menikmati si Wanoja Priangan. Tapi sebagai catatan, I hold all liability, jadi kalau rasanya agak aneh, mohon jangan salahkan petani atau roaster-nya, karena sayalah yang sepenuhnya bertanggung jawab untuk urusan aroma dan rasa. Projek Wanoja Priangan dan satu blend lagi yang sedang digodok hanyalah sedikit kontribusi yang bisa kami lakukan untuk orang-orang sepeti Yusri dan kelompok tani di Kabupaten Bondowoso dan semoga Anda mengingat mereka saat menikmati kopi ini. Tentu akan lebih syahdu saat ditemani musik dangdut remix dari Pantura. Untuk yang satu ini saya tak pernah salah. Have a great and awesome cup ! sukses pak Yusri & Team ! haha,amin pak.. semoga jalannya kesana..
Semoga jadi salah satu Q Grader Indonesia ! Pas banget karena minggu depan saya ada di Jember. Mas Yusri, dari dulu gak pernah membayangkan kalau cikopi ternyata cukup punya kontribusi terhadap petani karena ternyata banyak juga di antara mereka yang membaca blog ini. Saya ingat betul waktu kita ketemu di Jember, saat Mas Yusri bilang “Saya memang bisa menanam kopi, tapi kalau mau nyeduh dan lihat alat2 serta informasi tentang kopi, saya harus buka Cikopi. 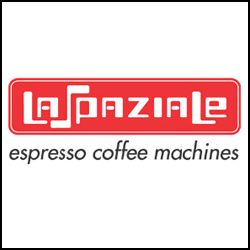 Hari ini baru terima kopinya, supaya gak ileran langsung aja – sesuai rekomendasi coba pakai french press. Makasih Hanzz testi-nya, saya justru senang baca ulasan kopi dari rekan-rekan di sini yang intinya menyukai Wanoja Priangan. 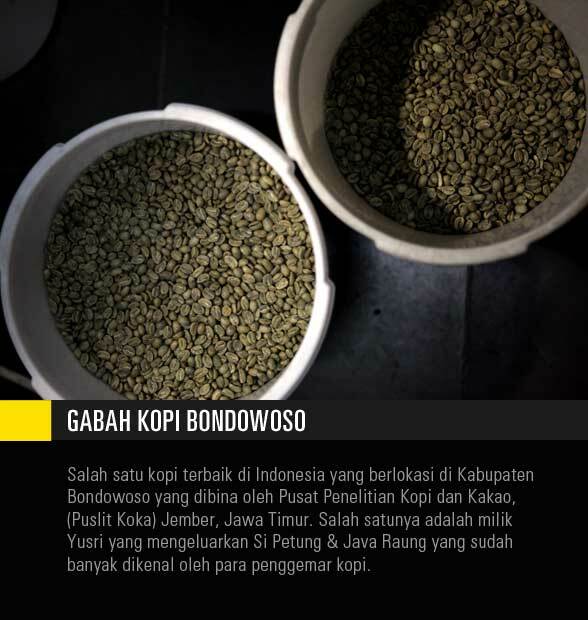 Artinya kopi dari Bondowoso sudah mulai digemari dan dikenal, buat saya itu yang paling penting terutama untuk meyakinkan para petani di sana supaya terus meningkatkan kualitas produksinya. pak toni,sory kelamaan kasi testi.. saya baru pulang soalnya..
kopi uda saya cobain pak,dibikin tubruk.. pas dibuka wangi bgt ya,agak coklat dikit tp lebih ke spicy dan ada lg yg saya ga tau itu apa..
untuk rasa saya suka krn kopi ini tdk terlalu asem meskipun ada lemon aftertaste nya.. spicynya enak,manis.. pas uda mau abis ternyata spicynya lebih keluar lg dan yg bikin saya kaget paitnya jg lebih menonjol.. jd pait2 spicy dgn lemon aftertaste.. ada earthy samar2 deh kayanya..
finishnya long sekali,kalo boleh saya bilang spicynya termasuk ‘nyegrak’ hehe.. jd unik,awalnya cukup smooth tp endingnya nendang.. bener2 kopi indonesia..
sekali lg terima kasih pak buat kopinya.. enak,sesuai selera saya..
Terima kasih dan senang mendengarnya kalau kopinya cocok dengan selera. Terharu melihat foto2nya di FB, dan rekan lainnya yang nge-tweet tentang Wanoja Priangan. Kita harapkan kopi Bondowoso terus berkiprah. @Wargo..Segera pak saya akan berkunjung ke Sidoarjo,menyeruput secangkir kopi di cyclo…. @ Pak Yusri, terimakasih atas pencerahannya pak. Kapan main ke cyclo sidoarjo nih? Salam kembali dari coffeelicious blog dan terima kasih …. Matur suwun Mas Prast, appreciated so much ! Mohon izin berbagi di halaman FB saya. @Wargo,,Nama si Petung diambil dari nama tempat tumbuhnya,Varietas Arabika.Ditanam pada ketinggian lahan 1600dpl..Metode Pengolahan Fully Washed Process..Si Petung Bsa di order Di Jakarta Coffee House..
Pak Toni, kopi nya sudah saya terima dan sudah saya coba. Dengan mengunakan french press Hario, grinder Skerton Hario (setting coarse). Kopi 10 gram + air panas 185 ml, steep 4 minutes*. Sweet, ada rasa chocolate nya sedikit, medium acidity, long after taste. *Tapi secara pribadi saya lebih suka steep cuma 2 menit, kopi terasa lebih light. Seperti yang anda bilang Pak, “My coffee, my way”. Thank you for the freshly roasted coffee. Sukses selalu buat Cikopi.com. Terima kasih banyak testimonial Pak Eddy, sebuah penggambaran yang sangat bagus tentang karakter rasa kopi ini. Sweetness memang salah satu ciri khas dari Wanoja Priangan yang sangat saya sukai berikut purna rasa atau after taste yang terus menggoda untuk kembali menikmati kopi tersebut. Orang tua saya antara lain orang yang menganggap after taste bagian yang sangat penting setiap kali ia mencicip kopi dan saya setuju saat rasa kopi terbenam dalam memori kita. Terimakasih untuk pencerahannnya. Nama aslinya si petung itu apa ya? Jarang-jarang soalnya, Bapak roasting, jadi penasaran rasanya seperti apa. Salam P.Toni Wahid,Makin Gencar aja Promosinya Untuk Kopi Bondowoso.”DEWAN PIMPINAN PUSAT ASOSIASI PETANI KOPI INDONESIA”mengucapkan Terima kasih kepada CIKOPI yg telah banyak meliput petani2 kopi Di Indonesia. Para pembaca, inilah pemilik kebun kopi yang melahirkan Wanoja Priangan, seorang petani dari Bondowoso yang telah memperkaya khazanah kopi Indonesia yang ditanam di Kecamatan Sumber Weringin. Terima kasih pak Yusri, komitmen saya dari dulu tidak berubah untuk terus memberikan dukungan sebisanya bagi para petani khususnya yang berada di Kabupaten Bondowoso. Apabila diperlukan, silakan menggunakan nama Wanoja Priangan untuk keperluan komersial para petani di sana sebagai bentuk apresiasi blog ini karena telah melahirkan kopi yang tak kalah dengan varian mainstream di Indonesia. Salam saya untuk Pak Sumarhum. sipetung and siraung sama kasusnya seperti kopi gayo dulu,’SUKU GAYO yang PUNYA KOPI,ACEH YANG PUNYA NAMA,BELANDA YANG PUNYA HAK PATENT’inilah nasib petani,mana hati nurani orang2 yang selalu teriak angkat harkat martabat petani …………. Maaf nuebie sekedar bertanya, sehubungan dengan Petung jadi hak patent artinya satu variant single origin bisa punya beberapa nama ya? tergantung Roasternya. Sekali lagi mohon maap kalau saya salah dalam bertanya. Maklum Nuebie. Hallow Pak TW…apa kabar ??? Kami ingin mempertegas utk ke 2 kali nya bahwa “Si Petung” itu bukan variant kopi , tetapi adalah HAK MERK DAGANG milik Jakarta Coffee House. Thx….!!! Kabar baik Pak Borie … dan well noted dengan penjelasannya. Kalau boleh saya tahu sejak kapan nama Si Petung menjadi hak paten milik JCH ? Hari Jum’at ini special delivery pada acara yang akan kita kunjungi … 🙂 Sampai ketemu. hanya ngiler saja, gak menang undian sih.